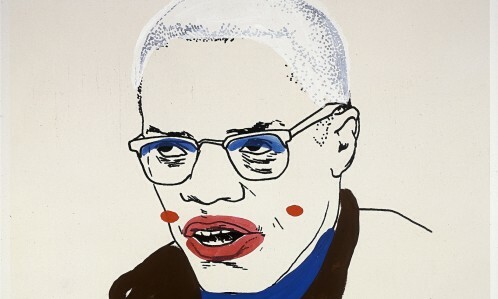 Famous for being Obama’s favorite artist and having his works hung on the walls of the White House, Glenn Ligon is now invading the UK with Encounters and Collisions displayed at the Nottingham Contemporary before moving to the Tate Liverpool. Encounters and Collisions is curated by Ligon himself who delivers his own vision on Postwar art. He began the project two years ago by sending letters to artists who inspire his work, even deceased ones such as Jean-Michel Basquiat. Having collected his favorite and most arousing art pieces, the exhibition is now achieved and features 40 different artists, all major figures in Postwar American art. American identity in the last 50’s years is thus the focus of show. Along with seven works of the artist himself, the art pieces of Jackson Pollock, Jasper Johns, Bruce Nauman or Franz Kline forms the main body of Encounters and Collisions. They all allude to American History and correlate with Ligon’s work in his quest of the formation of his country as a whole. As such, Ligon investigates on race and homosexuality, his topics of claim and exploration. “Bear”, the centerpiece of the show, is a video installation by Steve McQueen featuring two naked men wrestling in silence in an aggressive yet sensual way as well as Stephen Shames’ picture of the Black Panther founder Huey P Newton serve as embodying Ligon’s idea of America. 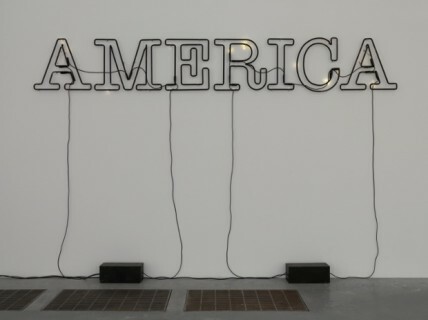 Glenn Ligon Untitled, 2006. Tate Collection. Glenn Ligon, Malcolm X #1 (small version #2), 2003. Courtesy the Rodney M. Miller Collection.